The factory, our today’s head office, first produced a citrus-flavored soft drink under brands “Happy” and “Double Happy”. During the World War II, we distributed our products to the Japanese military base camps and in Yaowarat area (currently known as China Town). Nowadays, this area is one of the most busy business districts in Bangkok. Later in 1981, Lactasoy soymilk was born. We had converted the production into soymilk products by pioneering the use of U.H.T (Ultra High Temperature) treatment for the soymilk production process. 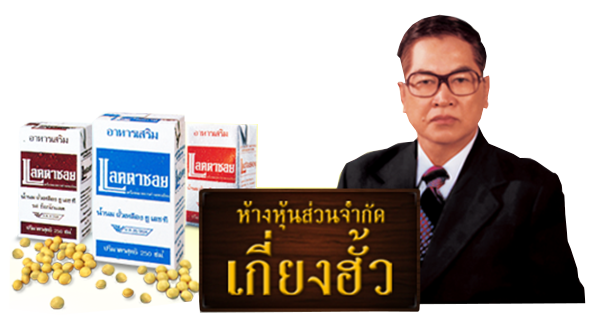 And, Lactasoy has become the first manufacturer in Thailand producing U.H.T soymilk. Because we never stop improving our products, Lactasoy is also first to use the aseptic packaging technology of Tetra Pak®. With this packaging technology, Lactasoy’s products can be preserved without being chilled for prolonged periods. In 1991, Lactasoy relocated our factory to Srimahaphot, Prachinburi. This expansion definitely increases our production capacity and our distributive efficiency. UHT is known as the most economic method for preserving food through modern technology. This is done by bringing the product to 132 Celsius for just a few seconds and immediately lower it to room temperature. Product is then filled immediately into a special paper carton under sterilized condition. This process is believed to retain most of the nutrition of the product. With this special packaging , the products can be kept fresh without refrigeration for 8 months. NO PRESERVATIVE IS ADDED. We have a strong commitment to contribute the products with excellent quality and highest nutrition. We have a great relationship with our employees, distributors, and consumers which we are collaborative working as a family. Maintain company reputation with more than three decades through sincerity with our customers and business partners. Be recognized as the best in class soymilk manufacturer with carefully selected the ingredients in order to produce the highest quality of Lactasoy soymilk for our customers. Continue to professionally develop of most valuable skills and knowledge for improving operations competency and creating product value. Be up to date in advanced technologies and invest in excellent and expert manpower to ensure the production of the finest and the most hygienic Lactasoy soymilk are always met the highest standard. Our highest quality soymilk starts from selecting the best raw materials through delivery Lactasoy product to the end-consumer. We select a premium-quality soybeans with Non-GMO (genetically-modified organism) and high protein content. Moreover, with the most advanced high speed fillers and packaging technology from Tetra Pak – Sweden and SIG Combibloc – Germany, it can ensure that Lactasoy production process meet the international standards.